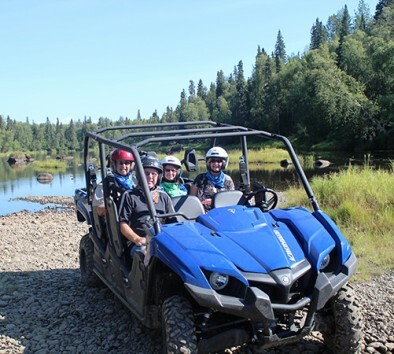 Climb in the passenger seat of a custom Yamaha six-seater “side by side” UTV for an exhilarating off-road adventure with a friendly driver-guide. Come have fun and learn about the wildlife and vegetation that dwell in the wilderness and how each survives the winter. Your guide will drive you to local salmon streams where you can make a short stop for photos and witness local wildlife. After that, you will make your way through the cottonwood forest on the way to the mighty Susitna River banks. Bring a camera because you never know when one of Alaska’s abundant wildlife might show themselves. This is a great family fun tour for all ages, so bring the kids or the grandparents! Minimum age is 4. Helmets, gloves, safety glasses, bandanas, rubber boots, rain pants and rain jackets will be provided. Tour will operate rain or shine. Tour operates subject to meeting a minimum number of participants. Wildlife sightings are likely but not guaranteed. Tour does not operate on Saturdays. Time on ATV is approximately 2 hours.